Falkor encounters an interesting cloud formation during the Sea Surface Microlayer expedition. Ajemian, M., Wetz, J., Brewton, R., Streich, M., Downey, C., and Stunz, G. (2016). Relative Value of Rigs-to-Reefs Habitats to Red Snapper (Lutjanus campechanus) Stock Building in the Western Gulf of Mexico. Oral Presentation at Benthic Ecology Meeting, Portland, ME, USA. Anderson, R., Reveillaud, J., Eren, A., McDermott, J., Seewald, J., Stepanauskas, R., and Huber, J. (2016). Strain-level variation of subseafloor microbial populations from venting fluids at the Mid-Cayman Rise. Oral Presentation at International Society for Microbial Ecology General Meeting, Montreal, CAN. Baker, E., Walker, S., Resing, J., Chadwick, W., Merle, S., and Anderson, M. (2016). Hydrothermal Plume Surveys of the Mariana Backarc (12.7°-18.3°N) by Surface-Ship and AUV Find an Unexpectedly High Spatial Frequency of Vent Sites, Oral Presentation at American Geophysical Union Fall Meeting, San Francisco, CA, USA. Clague, D., Paduan, J., Moyer, C., Glazer, B., Caress, D., Yoerger, D., and Kaiser, C. (2016). Structure and Evolution of Hawaii’s Loihi Seamount from High-resolution mapping, Oral Presentation at American Geophysical Union Fall Meeting, San Francisco, CA, USA. Fortunato, C., Butterfield, D., Larson, B., Algar, C., Vallino, J., and Huber, J. (2016). Microbial Metabolic Potential and Gene Expression Patterns across Geochemical Gradients in the Deep Ocean, Oral Presentation at International Society for Microbial Ecology Meeting, Montreal, CAN. Girard, F., Fu, B., Boyer, T., Curtis, C., and Fisher, C. (2016). Using Image-based Long-term Monitoring to Understand the Biology and Recovery of Deep-sea Coral Communities after the Deepwater Horizon Oil Spill, Oral Presentation at the 6th International Symposium on Deep-sea Corals, Boston, MA, USA. Hirsh, H., Chadwick Jr., W., Fryer, P., Villagomez, A., Beauregard, L., Cabrera, I., and Peterka, L. (2016). Exploring and Protecting the Marvelous Marianas Trench Marine National Monument, Poster Presentation at International Union for Conservation of Nature World Conservation Congress, Honolulu, HI, USA. Huber, J. (2016). Life Beneath the Seafloor. Oral Presentation at Microbial Sciences Initiative, Cambridge, MA, USA. Huber, J. (2016). Microbes, Fluids, and Rocks: Life Beneath the Seafloor. Invited Lecturer, University of Southern California, CA, USA. Kelly, S. (2016). The Moon, Climate, and Ocean Turbulence, Guest Lecturer at University of Wisconsin La Crosse, La Crosse, WI, USA. Kelly, S. (2016). The Moon, Climate, and Ocean Turbulence, Guest Lecturer at St. Olaf College, Northfield, MN, USA. Kelly, S. (2016). The Moon, Climate, and Ocean Turbulence, Guest Lecturer at Gustavus Adolphus College, St. Peter, MN, USA. Kelly, S. (2016). The Moon, Climate, and Ocean Turbulence, Guest Lecturer at Concordia College, Moorhead, MN, USA. Kelly, S. (2016). The Moon, Climate, and Ocean Turbulence, Guest Lecturer at University of Minnesota Duluth, Duluth, MN, USA. Lowe, R. (2016). Oceanic Drivers of a Remote Atoll Reef System: Browsing Scott Reef. Oral Presentation at Shell EMI Seminars, Perth, AUS. Maticka, S. (2016). Hydrodynamics and Thermal Regime of a Shallower Reef-Atoll Rim. Oral Presentation at Ocean Sciences Meeting 2016, New Orleans, LA, USA. McBee, J., Mitchell, G., Brumley, K., Gharib, J., and Paull, C. (2016). New Insights into the Campeche Escarpment Post-Chicxulub Impact Using Multibeam Echo Sounder (MBES) Bathymetry and Backscatter Data, Poster Presentation at American Geophysical Union Fall Meeting, San Francisco, CA, USA. McCulloch, M., Holcomb, M., D’Olivo Cordero, J., Falter, J., Montagna, P., Taviani, M., and Trotter, J. (2016). How Corals Control Calcification in a High CO2 World, Oral Presentation at International Coral Reef Symposium, Honolulu, HI, USA. Miller, J., Puotinen, M., Thumbs, M., Radford, B., and Heyward, A. (2016). Innovation in Spatial Analysis Using Examples from Scott Reef and the Kimberly’s. Oral Presentation as part of Woodside Science Seminar Series, Perth, AUS. Moore, C., Heyward, A., and Radford, B. (2016). Comprehensive and Accessible Information Promoting the Biodiversity, Heritage and Value of our North West Marine Region. Guest Lecturer, Charles Darwin University, Darwin, AUS. Moore, C., Heyward, A., and Radford, B. (2016). Comprehensive and Accessible Information Promoting the Biodiversity, Heritage and Value of our North West Marine Region. Oral Presentation at Guest Atlas of Living Australia Workshop, Perth, AUS. Moore, C., Heyward, A., and Radford, B. (2016). Comprehensive and Accessible Information Promoting the Biodiversity, Heritage and Value of our North West Marine Region. Oral Presentation at PTTEP Australia Science Seminar, Perth, AUS. Pinkel, R., et. al. (2016). The Tasman Tidal Dissipation Experiment: Tidal Mixing, Scattering, and Reflection on the East Tasman Slope, Oral Presentation at Ocean Sciences Meeting 2016, New Orleans, LA, USA. Rayson, M. (2016). Observations of High-frequency Internal Waves and Strong Turbulent Dissipation Rates Generated by a Constriction between Two Coral Atolls. Oral Presentation at 8th International Symposium on Stratified Flows, San Diego, CA, USA. Resing, J., Chadwick, W., Baker, E., Butterfield, D., Baumberger, T., Buck, N., Walker, S., and Merle, S. (2016). Hydrothermal exploration of the Mariana Back-Arc Basin: Chemical Characterization, Poster Presentation at American Geophysical Union Fall Meeting, San Francisco, CA, USA. Streich, M., Wetz, J., Ajemian, M., and Stunz, G. (2016). Relative Abundance, Age, and Growth of Red Snapper: A Comparison between Artificial and Natural Habitats in the Western Gulf of Mexico. Oral Presentation at Southern Division of the American Fisheries Society Annual Meeting, Wheeling, WV, USA. Urschel, M., Moyer, C., Glazer, B. and Rogers, K. (2016). Cryptic Anaerobic Metabolisms in the Deep Subsurface. Oral Presentation at Center for Dark Energy Biosphere Investigations All-hands Meeting, Monterey, CA, USA. Vohsen, S., Baums, I., and Fisher, C. (2016). High-throughput Metabolomics Identifies Species- and Habitat – Specific Metabolites in Corals, Oral Presentation at 13th International Coral Reef Symposium, Honolulu, HI, USA. Walker, S., Baker, E., Resing, J., Chadwick, W., Merle, S., and Kaiser, C. (2016). High resolution mapping of hydrothermal plumes in the Marian Back-arc Relate Seafloor Sources to Above-bottom Plumes, Poster Presentation at American Geophysical Union Fall Meeting, San Francisco, CA, USA. 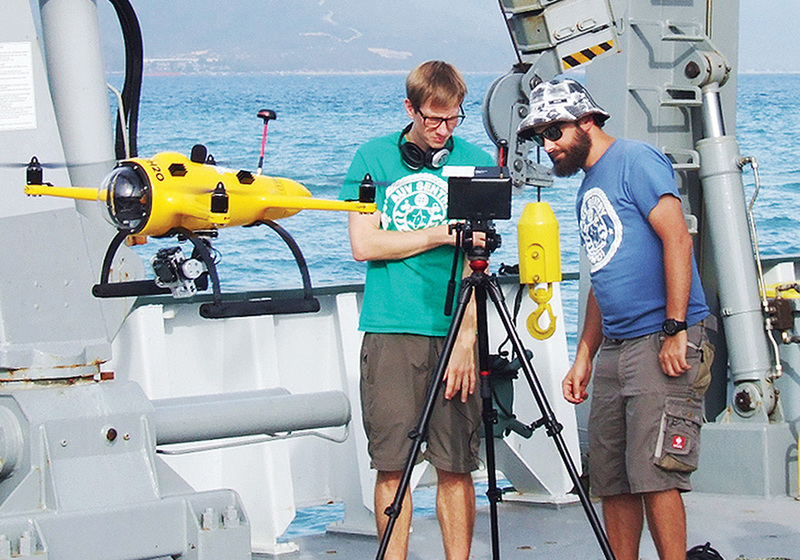 Multimedia Correspondent Thom Hoffman and Systems Engineer Todor Gerasimov work with the Schmidt Ocean Institute Outreach waterproof AUV (Aerial Unmanned Vehicle) on Falkor’s Aft deck. Chaytor, J., Geist, E., Paull, C., Caress, D., Gwiazda, R., Fucugauchi, J., and Vieyra, M. (2016). Source Characterization and Tsunami Modeling of Submarine Landslides Along the Yucatán Shelf/Campeche Escarpment. Southern Gulf of Mexico: Pure and Applied Geophysics, pp. 1–16, doi: 10.1007/s00024-016-1363-3. Fortunato, C. and Huber, J. (2016). Coupled RNA-SIP and Metatranscriptomics of Active Chemolithoautotrophic Communities at a Deep-sea Hydrothermal Vent, The ISME Journal, pp 1-14, doi: 10.1038/ismej.2015.258. Girard, F., Fu, B., and Fisher, C. (2016). Mutualistic Symbiosis with Ophiuroids Limited the Impact of the Deepwater Horizon Oil Spill on Deep-sea Octocorals, Marine Ecology Progress Series, 549: 89-98, doi: 10.3354/meps11697. Kleindienst, S., Grim, S., Sogin, M., Crespo-Medina, M., and Joye, S. (2016). The Responses of Diverse Low-abundance Bacteria to a Deep-sea Hydrocarbon Plume, The ISME Journal, 10, 400-415, doi: 10.1038/ismej.2015.121. Linley, T., Gerringer, M., Yancey, P., Drazen, J., Weinstock, C., and Jamieson, A. (2016). Fishes of the Hadal Zone Including New Species, in situ Observations and Depth Records of Hadal Snailfishes, Deep Sea Research, 114, 99-110, doi: 10.1016/j.dsr.2016.05.003. Rayson, M., Bleuteau, C., Ivey, G., and Jones, N. (2015). Observations of High-frequency Internal Waves and Strong Turbulent Mixing in a Channel Flow between Two Coral Atolls, Conference Proceedings of the 8th International Symposium on Stratified Flows. Topcuoglu, B., Stewart, L., Morrison, H., Butterfield, D., Huber, J., and Holden, J. (2016). Hydrogen Limitation and Syntrophic Growth among Natural Assemblages of Thermophilic Methanogens at Deep-sea Hydrothermal Vents, Front. Microbiol, 7:1240, doi: 10.3389/fmicb.2016.01240. 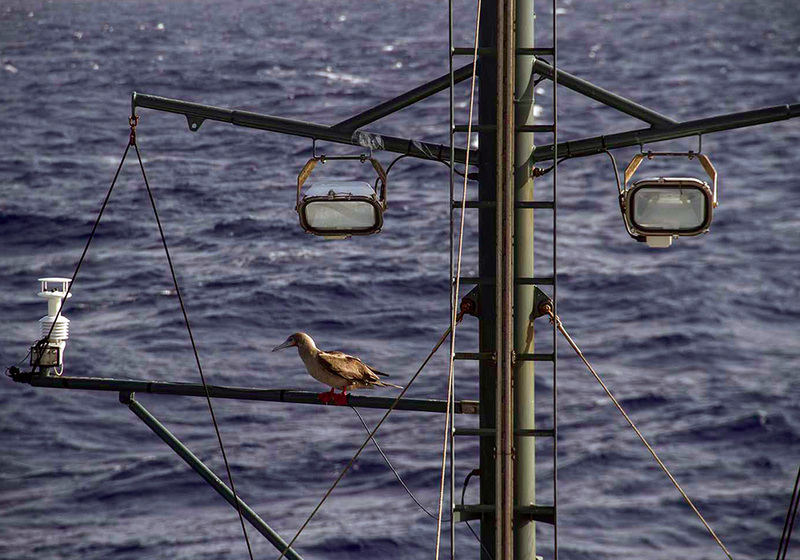 Boobie on Falkor’s mast as she transits from Honolulu to Tahiti during the Investigating Life without Oxygen Expedition. 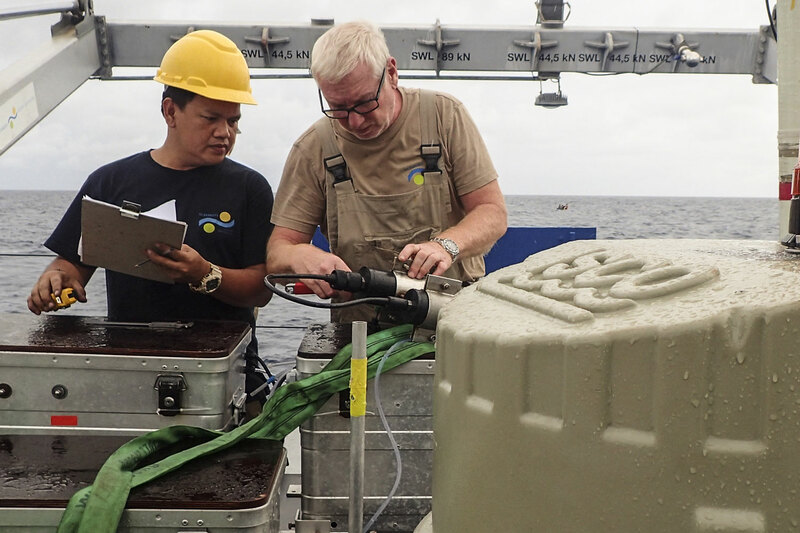 Chief Engineer Allan Watt and Fitter Edwin Pabustan work together to repair the remotely operated Catamaran.